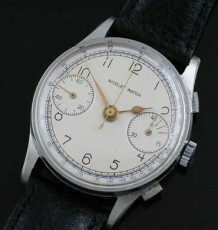 Mint Condition new old stock Swiss Chronograph, world time functions with slide rule calculator. 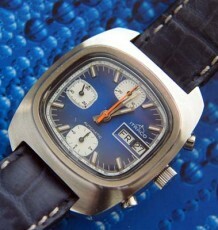 Unusual and large Swiss made Chronograph in new old stock condition. 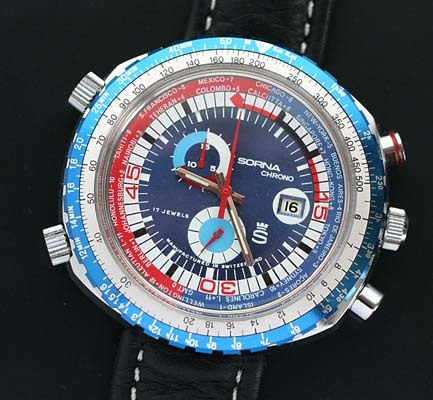 This Sorna Swiss Chronograph features a very colourful and complicated dial arrangement. Aside from the typical stop and start stop watch functions with a 30 minute counter, the watch also has a running seconds register, a date window and a world time multi-timezone outer ring. The outer bezel is configured as a slide rule calculator and adds more colour to the appearance of the watch. Slide rule calculators are typically found on pilots Chronographs like Breitling models. The watch is fitted with a 17 jewel shockproof Sorna movement which is running properly and keeping time. 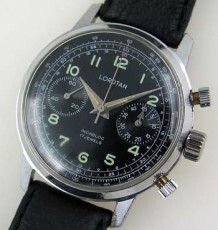 The watch measures 47 mm wide excluding the crowns and 44 mm long at the lugs. 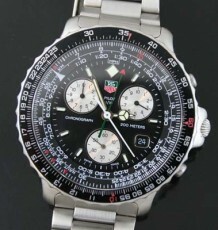 This is a large eye catching watch that commands wrist presence when worn.